The south end of Maria Island is generally best visited (if walking) from a camping base at either French's Farm or Encampment Cove. This is what I did on my previous trip. You can get to these places either by walking from Darlington or being dropped at Encampment Cove or Chinamans bay by boat. I believe one of the ferry companies may offer this service. You can also cycle, but if you are biking, you may find that you can visit South Maria in daytrips from Darlington. Just be aware that the track across the Isthmus is very sandy and I think cycling on it would be very difficult - these few kilometres might be a push. The south end of the north island and South Maria itself are very interesting. Many walkers to French's Farm just walk a further very short distance to Chinamans Bay, which is the northern curve of Shoal Bay and is a very calm sheltered spot to sit for lunch. I walked on a bit further to The Isthmus, as I wanted to visit Riedle Bay. This is the ocean beach on the eastern side of The Isthmus. Just be aware that walking this far is around 14.5km each way, and can make for quite a long walk for those not used to such distances. Other walks possible from Darlington, but also quite lengthy, are to Encampment Cove, Point Lesueur (convict cell ruins) or the beaches north of there. 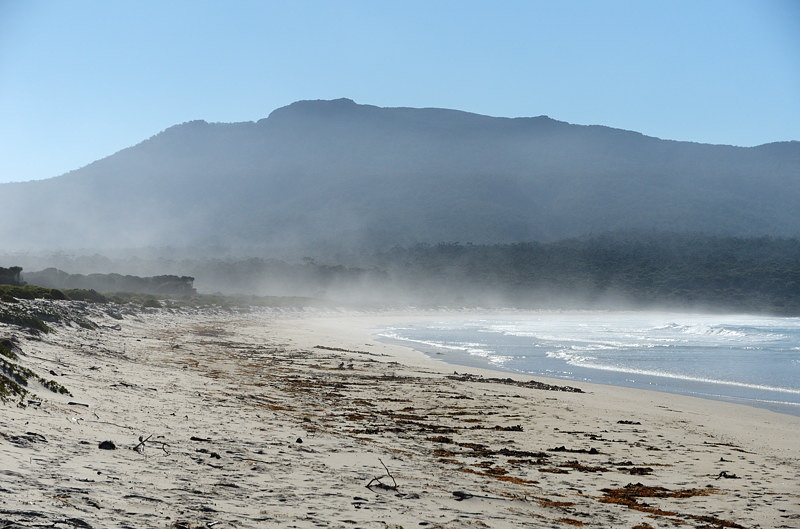 These beaches include Four Mile Beach, Soldiers Beach and Bloodstone Beach. It is apparently possible to walk to Point Lesueur via the roads and tracks and then return via the coast to Return Point (track from there to the main road) or Four Mile Beach. This might be a walk for my next trip. Walk Description: It is around 11 km from Darlington to French's Farm. Further walks beyond there will extend the total walk to 25-29km. Make sure you really want to walk this far in a day. There are few hills, and those which exist are quite gentle and low, so your exertions won't be added to by vertical ascents. The road heads south out of Darlington, over the first headland on the same track as the Painted Cliffs walk. There are few navigational problems, and the track proceeds southwards, undulating over the low headlands and around the coastline. At Four Mile Creek/Beach the track heads a little more inland, before arriving at French's Farm. From here you choose to walk on to Chinamans Bay (very close by), Encampment Cover or The Isthmus. The Chinamans Bay track heads off to the right just beyond the bridge. To walk on further to the wilder ocean beach of Riedle Bay you have to walk about 35 minutes on the softish sandy track until you find an obvious track crossing the main track. Turn left and in a couple of minutes you emerge on the large beach which in heavy weather can be quite wild. I estimated that the total walk, not including any wandering up and down the beach was 28 or 29km. Riedle Bay may only be good for swimming at certain points or in very calm weather. On each of my visits (three now) it has appeared to have very significant undertow and rips, and could only be recommended to the very experienced. The far northern and southern ends of the beach may be safer and more sheltered. The centre of the beach can certainly be subjected to large waves sweeping up to and even into the dunes when the weather is rough. However, this also makes this an attractive place to visit. If you want a gentle paddle and swim, maybe the western side of The Isthmus would be preferable.